Box Text: Welcome to a world gone mad. The Xenozoic age, a world 600 years in the future, where dinosaurs of the past co-exist with men and women of the future in a desperate struggle for survival. 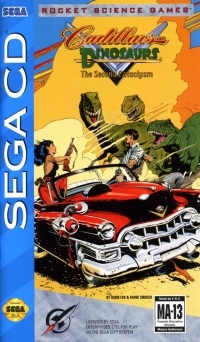 Power your '53 Cadillac through 9 post apocalyptic levels of danger as jack "Cadillac" Tenrec and Hannah Dundee race through treacherous jungles full of poachers, predators and un-natural hazards, to stop the Second Cataclysm and restore the planet's natural balance. 03-19-2012 atariboy Box Text Welcome to a world gone mad. The Xenozoic age, a world 600 years in the future, where dinosaurs of the past co-exist with men and women of the future in a desperate struggle for survival. 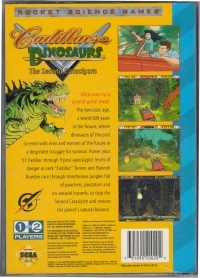 Power your '53 Cadillac through 9 post apocalyptic levels of danger as jack "Cadillac" Tenrec and Hannah Dundee race through treacherous jungles full of poachers, predators and un-natural hazards, to stop the Second Cataclysm and restore the planet's natural balance. 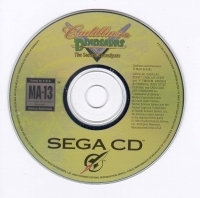 This is a list of VGCollect users who have Cadillacs and Dinosaurs: The Second Cataclysm in their Collection. This is a list of VGCollect users who have Cadillacs and Dinosaurs: The Second Cataclysm in their Sell List. This is a list of VGCollect users who have Cadillacs and Dinosaurs: The Second Cataclysm in their Wish List.